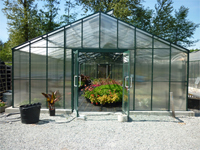 - These Feature Greenhouses are on sale every day! Our Traditional Series have straight eaves, the Pacific Series has curved eaves, and our Cape Cod series has a special roof slope of 12 / 12, giving it a 45 degree slant on the roof angle. 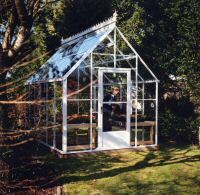 These greenhouses are also available in many sizes. To receive your free quote in another size, please call 1-800-665-2124.